Exercising – the very first picture that strikes you when you hear this word is an adult treading his steps on a treadmill or lifting weights. When it comes to kids, exercising takes a different meaning. It is more of indulging in fun filled physical activities. And, yoga is one of the best exercises that kids can include in their busy schedule… Wondering why? 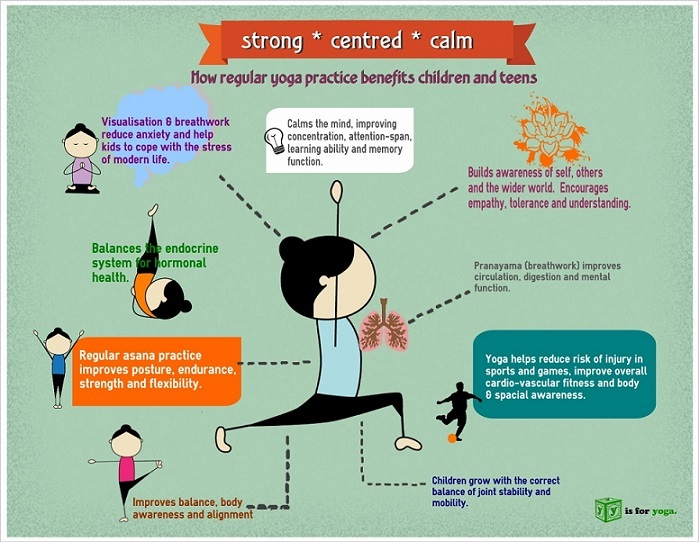 Here are a few interesting reasons why kids should do yoga! Here are 17 amazing easy to do yoga poses for your kids, including a meditation technique and a breathing pattern. Standing tall as a mountain will strengthen them from outside and inside. A stronger back, legs, hands, and a better focus – that is what Tadasana is for. Kids who want to improve their height should practice this posture. Stand straight on the floor with foot separate slightly. Keep your hands along your body. Keep the spine erect, while head, neck, and shoulders are relaxed. Inhale, lift your hands over your head, and join your palms, fingertips pointing to the ceiling. Close your eyes and hold the posture, taking deep breaths. Elder kids can continue. Inhale and lift your heels off the floor, balancing your body on the tip of your toes. Keeping the eyes closed, hold the pose for 10 deep breaths. Exhale, release the hands, and bring down the heels to the floor. Relax in the initial posture. This is yet another pose that focuses on balance and stability. The extra stretch it offers to the body keeps it stronger, adding a certain level of suppleness. Teens can choose the pose to indulge in a quick meditation just before they are about to enter their exam hall as it is one of the best relaxing easy yoga pose for kids. Stand straight on the yoga mat, back and head erect, shoulders rolled back and relaxed, while hands rest along your body. Inhale and shift your left leg away from the right in such a way that the legs are now wider than hip distance. Simultaneously, spread your hands out on either directions at shoulder level. Let the palms face the ceiling. You can spread the legs a little more apart or till you feel a comfortable stretch behind your thighs. Close your eyes and take deep breaths and relax. Exhale, join your legs together, release your hands to body sides, and relax. This pose is good for a stronger legs, back, shoulders, and arms as well as for improving and enhancing the stamina. It improves your balance while opening up the chest, and paving way for better circulation. Kids can make it into a flow by swaying from side to side. Stand straight on the mat, hands along your sides, back and head straight, while shoulders are relaxed. Inhale and lift your hands over the head, joining the palms, fingertips facing the ceiling. Exhale, bend to your right, from the waist. Tilt your head slightly to the right and gaze towards your left. Exhale, bend to your left, from the waist. Tilt your head slightly to your left and gaze towards your right. Inhale, come to the center. Exhale and release your hands. Come back to the starting posture. This makes one repetition. You can do 10 repetitions. Sit on that invisible chair and learn to correct your posture, kids! You can do this even while watching your favorite cartoon or munching on that bowl of caramel popcorn. It corrects the posture, strengthens your legs, and even helps you pull in that small bulge of your tummy. Stand straight on the mat, feet together, hands resting along the body. Exhale, bend your knees, and bring down your arms allowing the fingertips touch the floor. Inhale and sweep your hands over your head, aligned with the ears. Tuck your navel and tummy in while holding your thighs and knee caps tight. Push your hips back in such a way that your knees are stacked atop ankle and you can see your toes. Inhale, exhale, and release the hands. Straighten the knees and come back to the starting posture. Let go off your worries, kids, and just hand yourself in this pose. You can feel the way blood just rushes into your face and brain, leaving your flushed, fresh, and rejuvenated. An awesome stress buster, it offers the kids a great way to invoke their creative side too. Stand straight on the floor, feet slightly separated, preferably maximum at hip distance. Let your hands rest along the sides while head and neck is erect. Keep your shoulder relaxed. Inhale and sweep the hands over your head. Exhale and fold forward from your hips. Let your head hang freely allowing the crown to come closer to your foot. Keep the knees softly bent. Taking deep breaths, let go off everything and hold the posture for 10 deep breaths. Inhale and come back to the initial position. A classic push up pose, it is a fabulous whole body energizer. It also helps in strengthening the core and back. Teens, especially girls out there, try this out if you aim is that washboard abs. 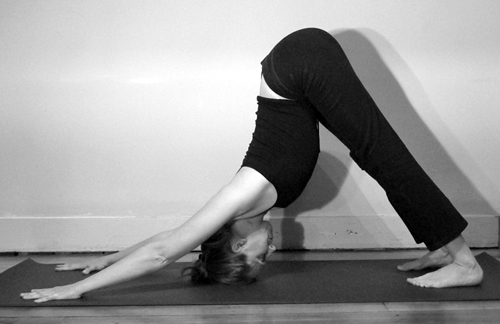 Exhale and fold forward from your hips, allowing your head to come closer to shin. Let the palms rest on the ground firmly. Align your hands in such a way that your wrist comes just beneath the shoulder. Exhale and adjust your torso, aligning the hips, so that your body is a slanting straight line from head to toe. Breathing deeply hold the pose for 5 deep breaths. Exhale and lower your body, stretching out the toes towards back, and hands resting along your body. You can start this from where you left the previous pose. Place your palms aligned with the chest. Inhale, push your arms, and lift your torso off the ground. Keep the elbows bent and balance yourself on your abdomen. Tuck your navel in and squeeze in your buttocks. Inhale and straighten your elbows. Tilt your head back gently and fix your gaze at the ceiling. Breathing deeply, hold the pose for 10 deep breaths. Exhale, release your arms, and lie down on your abdomen. Give your whole body a gentle, yet powerful stretch, nourishing it physically and mentally with the Downward Dog Pose. Let go off your body the way a little puppy does as it stretches itself… Go ahead and enjoy…. Lie down on your abdomen, toes stretched out to the back wall. Place your hands at chest level. Inhale and as you exhale, push your palms firmly onto the ground, tuck your toes and lift your torso off the floor. Keeping pushing the heels to the ground. Keep lifting the tailbone to the ceiling, while urging your head to come down in between the feet. Indulging in deep breathing, hold the pose, for 10 deep breaths. Inhale, lift your right leg and place the right foot in between your palms. Exhale and place your left foot in between your palms. 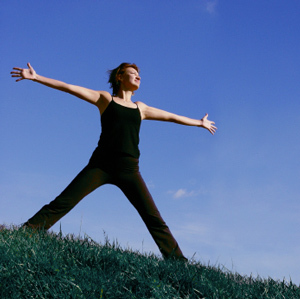 Inhale and lift your body up and come back to standing. Exhale, take a gentle back bend, release, and relax. 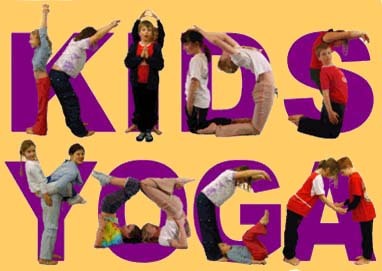 Want to know more interesting yoga moves for kids? 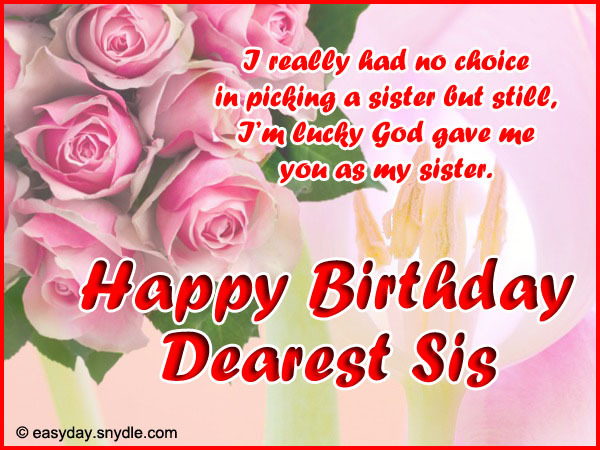 Click here….